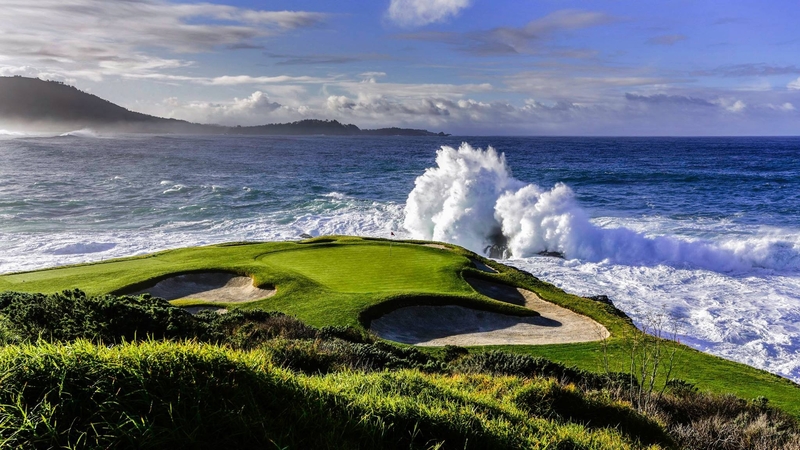 If you could choose any year to play Pebble Beach, this one should be it. Pebble Beach celebrates its Centennial in 2019, a historic milestone for the California resort culminating with the playing of a sixth U.S. Open along the splendid shores of Stillwater Cove this Father’s Day. While Pebble Beach has been nailed to the top of Golf Digest’s 100 Greatest Public Courses rankings ever since the list began, the entire resort has never looked better. In preparation for the centennial celebrations, Pebble Beach just completed a renovation of every room across the resort, and now offers luxurious Golf Cottages at its Fairway One complex – the newest extension of The Lodge. The unveiling of a brand new Pebble Beach Visitor Center ushered in the Centennial Celebration this past winter, sharing a century of stories with the 2 million tourists who enter 17-Mile Drive annually. Now a reimagined Wall of Champions behind the first tee lionizes the litany of legendary winners at Pebble Beach. Hall of Famers Sam Snead, Ben Hogan and Phil Mickelson are past winners of the PGA Tour’s annual AT&T Pebble Beach Pro-Am, while Nicklaus, Tom Watson and Tiger Woods all captured iconic U.S. Open victories at this venerable venue. The bust of a new champion will be added to the wall this June, and another will go up when Pebble Beach hosts its first U.S. Women’s Open in 2023. A seventh U.S. Open is already scheduled to return to Pebble Beach in 2027. No matter where you stay – unique offerings also include the swanky and exclusive estate rooms at Casa Palmero, the iconic ocean views at The Lodge, and the idyllic beachside setting that nestles up to The Inn at Spanish Bay – the heart of the Pebble Beach experience is golf. Three Pebble Beach Resorts layouts sit comfortably inside Golf Digest’s Top 100 Public Courses rankings: Pebble Beach (No. 1), Spyglass Hill (No. 11 – and second in California behind Pebble Beach), and The Links at Spanish Bay (No. 44). Each is worthy of a spot on your Pebble Beach itinerary. Spanish Bay features some of the most spectacular seaside scenery you will find, an atmosphere that is only enhanced by the romance of a bagpiper serenading you during a sunset finish. Spyglass Hill starts off with a spectacular sand-dune laden first five holes, one of the most dramatic and memorable introductions to your round in golf. And then there’s Pebble Beach. Seven straight holes hug the Pacific Ocean from Nos. 4-10, each with a memorable moment in golf history inseparable from it. Nicklaus calls the approach over a cliff at No. 8 his favorite second shot in golf. U.S. Opens have been spectacularly seized at the legendary 17th hole by Nicklaus and Watson. And the dramatic 18th hole might be the most recognizable and scenic in all of golf.